Since April 10-16 is National Volunteer Week, we'd like to acknowledge and thank each of our volunteers who have contributed time and energy to fulfilling the mission of Marine Parents. See article below and follow the link to view the names of those who were recognized by President Obama and presented President's Volunteer Service Awards. Also, we hope that you'll join us for our April 30th pack day, luncheon and scrapbook event. If you haven't registered yet, click here, because volunteer spots are filling up fast. Don't miss our Recon Marine guest speaker and chance to browse our online EGA Store in person! We're shipping 14,400 boxes of Girls Scout cookies to our deployed Marines in just a few weeks (April 30), and we are falling short on our goal. Time is running out, and we still need $13,000 of the $15,000 it will cost to ship these boxes. The Marines have received these cookies every year since 2004, and we can't let them down. We need your help getting these cookies overseas. Make a tax-deductible donation to our shipping fund by clicking here. It was recently announced that our next Sargeant Major of the Marine Corps will be SgtMaj Micheal Barrett. This is exciting news for us because Our Purple Heart Hero Support™ west coast manager Joyce Orrell knows SgtMaj Barrett well; he has attended our PHHS dinners at the naval hospital in Balboa in the past. On Sunday President Obama announced the start of National Volunteer Week, which is April 10th-16th this year, with a statistic that should make America proud: more than 63 million Americans volunteered their time in 2010 alone [USA Today]. Marine Parents is fortunate to have the support of a portion of those 63 million volunteers. More than 150 volunteer their time for us daily, and another 150 work with us intermittently on outreach projects. Our volunteers are the lifeline of the organization, and we appreciate their dedication to executing our mission. As Marine parents, family or friends you know how difficult it is to be thousands of miles away from your Marine. Luckily, one website, MotoMail.us, has made overseas communication much faster and easier for loved ones to get letters to their Marines. Register for free, then type and send electronic letters that will be printed overseas and delivered to your Marine within 24 hours. The letters are sealed and private. It can't get much simpler than this! Per OPSEC guidelines, we do NOT list the last name of you or your Marine. If you would like to add your Marine to this list for these purposes, click here. We'd like to introduce the special guest you will be fortunate to hear speak at our April 30th luncheon at the Marine Parents corporate office in Columbia, Missouri. We discovered only recently that he lives right here in town! Former Reconnaissance Marine Gerardo "Tony" Mena encourages us to see the world through his bright eyes in his recent singe, "I Felt the Earth Spin Today." 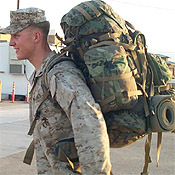 After six years in the Marine Corps, Tony is now producing original indie/rock music and poetry. His poem "So I was a Coffin" won first prize in the Winning Writers 2010 War Poetry contest, and two of his singles are featured in the Nashville Review. The publication's editor said he was so moved by Tony's music that it made him cry. Marine Mom Shannon sent us these photos to include with her participant bio on our Team Marine Parents™ page, but they were so great that we just had to show them off! We love that her family is sporting our custom recruit shirts! "My name is Shannon and my oldest son Remington is serving at his duty station in Iwakuni, Japan where he is a construction engineer. Remington is the oldest of our four children and the first to leave home which has been a big change for all of us. We are so proud of him and what he has accomplished! He loves driving his heavy equipment and does a great job for his command..."
Click here to keep reading and view more photos. Click here to shop our EGA Store! Thank you Shannon and family for letting us share your photos in The EGA Store's photo gallery. View other family photos in our "Semper Family" gallery! On April 10th one of our volunteers visited the naval hospital at Bethesda, MD, with two boxes full of 40 books for the wounded warriors. A popular book store in Peggy's area, Bay Books, recently closed due to the slow economy and the demand for the Kindle. On the store's last day open, owner Chuck O'Brien invited Peggy to stop by and choose some books to take to Bethesda for the wounded warriors and Purple Heart families. Peggy collected a variety of adventure, mystery and fantasy novels in addition to a few non-fiction books. A huge thank you goes out to Mr. O'Brien and our volunteer Peggy for bringing these to books to our Purple Heart Marines and their families! The banner used at the top of this newsletter is a March 2011 USMC photo by Sergeant Josh Cox of Marines with the 22nd Marine Expeditionary Unit watching a U.S. Coast Guard vessel patrol while steering away from the Morehead City State Port aboard USS Bataan, March 28, 2011. Click here to read additional credits.